Back in February, Caminar’s wonderful and tireless volunteer, Martha Mirabella, was among those recognized by the Peninsula Health Care District at its 9th Annual Community Partners Award Ceremony. We are grateful for the countless hours of hard work and positive energy Martha has dedicated to support Caminar’s San Mateo County region and agency administrative team. Martha manages the upkeep of our filing and records, which ensures an organized, efficient, and productive office. Our sincere thanks to Martha, and all of our dedicated volunteers, for helping us to serve individuals and families in our community who are in need. And, many thanks for the Peninsula Health Care District for recognizing one of our own! 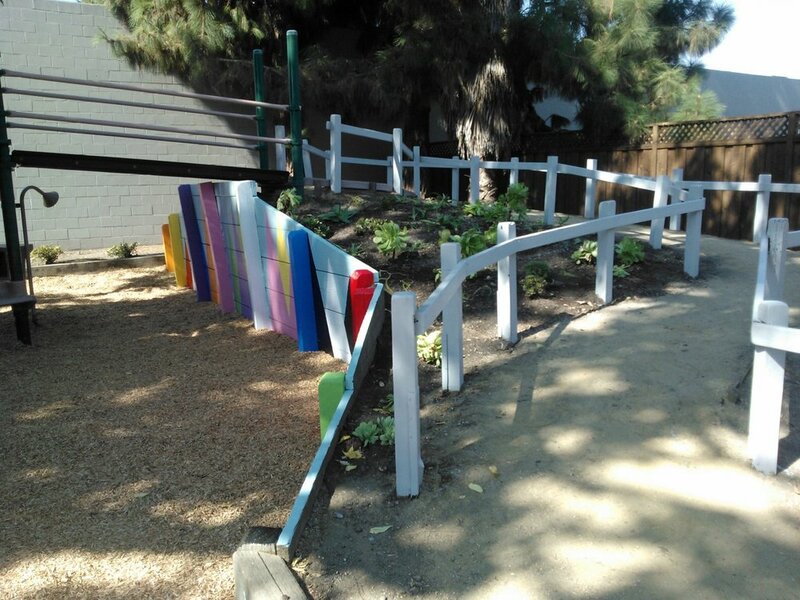 On Sunday, October 8, the playground used for children’s therapy at our Julian Street facility received much-appreciated attention and improvements from the Rancho chapter of the Young Men’s Service League (YMSL). YMSL is a mother-son organization dedicated to serving local communities and enhancing mother-son relationships. The young men and their mothers participate in a four-year program of philanthropy, education, and leadership. In addition to other efforts and projects, every year each chapter gives the Ultimate Gift. The Ultimate Gift provides substantial support and a transformational project to a program or philanthropy to better help them serve the needs of their community. We are grateful to the YMSL Rancho chapter for choosing our Julian Street playground to receive their chapter’s 2017 Ultimate Gift. YMSL members arrived in force on Sunday with smiles and a strong work ethic in tow. The volunteers renovated the playground to not only improve the aesthetics but also to improve the safety and usability of the space. A thorough power washing of the jungle gym and area ensured a clean palette. The area around the jungle gym area was then completely filled with bark, making it much safer. Lovely plants were added and a beautiful mural was painted to add a pop of color. As well, the team donated basketballs, a hoop, whiffle balls and bats, sidewalk chalk, a new ball pump, and other recreational equipment. To top it all off, YMSL also contributed a much-needed storage bin, a patio set with a new umbrella, and a hose. Our staff was thrilled to see the improvements and our littlest clients are in for an exciting week as they rediscover the magic of this playground. We are profoundly thankful for the time and effort these young men and their mothers dedicated to our program and playground. Their hard work and caring will greatly benefit these children who are in need of a fun and safe place to play and express themselves.